Before there were spotlights and solos… there were homilies and hymns! The Byng Community Theater was not always home to ASPI and their theatrical performances. The building used to be St. Louis Catholic Parish and its history goes all the way back to 1909. 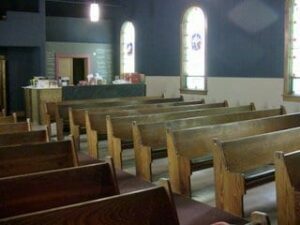 It all began as a mission church of St. Patrick’s in Stiles. Father Philip St. Louis, who was pastoring in Stiles at the time, came together with 13 other families to begin organizing the first Catholic Parish in Abrams. In 1910, services were being held in a hall above the general store and it wasn’t until the fall of 1911 that the church on Maple was built. Unfortunately, on Sunday February 6th, 1927, a chimney fire destroyed the church. 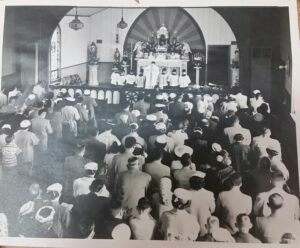 But the congregation came together and rebuilt the church, and in August 1927 it was blessed by the Bishop of Green Bay. 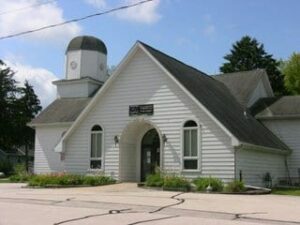 In August 2003, ASPI held their first show, Emmerella, at the Abrams Town Hall. Then in 2007, ASPI found their future home, the St. Louis Church. The building was acquired and the crew was busy making updates to create their theater. This included remodeling to create a stage, a backstage area, and a concession stand. On October 24th , 2008, ASPI held their first production, Unwrapped, in their new theater. When you walk into the theater, you can still see and feel the history of days gone by. But the theater is constantly looking for ways to improve and maintain its valuable presence in the community. Recent updates include a fresh paint job; a new and improved control booth for sound, lighting, and projecting; the addition of modular set booms (see past blog post); and more future updates to be announced. 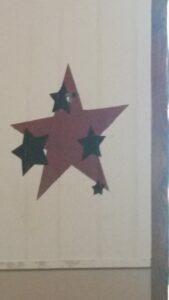 Top left- the old paint job, remember the stars? This entry was posted in Uncategorized on July 26, 2017 by Ali Carlson.